A couple of rainy Saturdays ago, we were looking for a little something to do, and wound up at a craft show held at a local firehouse. Mother’s Day is coming up so I thought I’d keep an eye out for mom gifts. There were a lot of lovely, but usual, items. Soaps, leather goods, lots of jewelry, pillows, and fleece blankets. And in another room, a little pottery, cutting boards, kettle corn, jam, and maple syrup. Everything was well-made, but nothing was really catching my eye…until we made our way into the last room. WHAT?! Could it be?! A pen booth?!! Why yes it was. I think I yelped with excitement. Maybe not out loud, but something in me yelped. Because I’ve NEVER seen handmade pens at craft shows. Until now. Bob & Virginia Lenhart had a table loaded with wonderful handmade pens. It sounds cliche, but there really was something for everyone. They had pens made from exotic Bethlehem Olivewood and Bog wood, pens made to resemble the shocks on a Harley-Davidson bike, bolt-action pens, pens with styluses (stylii? ), and pens made from colorful acrylics…all gorgeous and unique. I should’ve had the presence of mind to take a picture of their table, but I was so pen happy that the thought never crossed my mind. 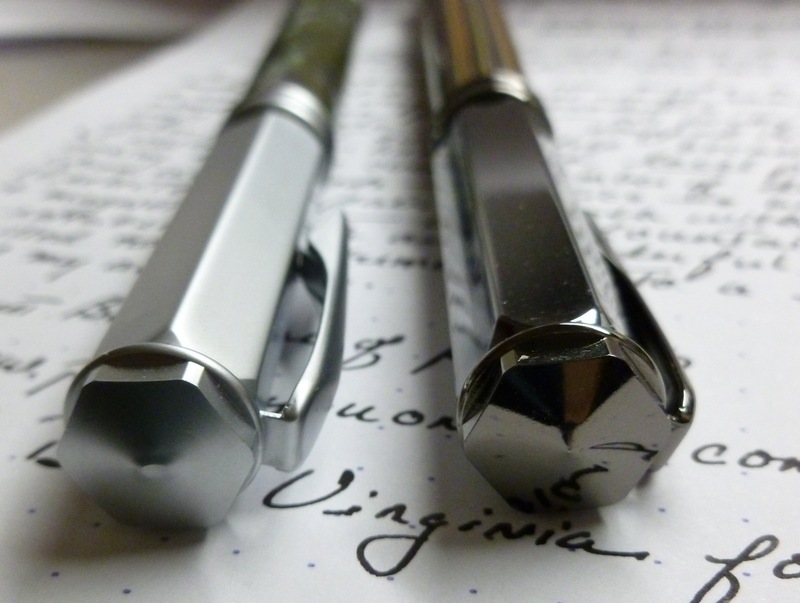 I quickly honed in on a pair of hefty acrylic pens…one a rollerball, the other a fountain pen…both with magnetic caps. SO COOL. These are substantial pens. I only have a so-so kitchen scale, but I’d put them around 1.5 ounces (or about 43 grams), which is about twice the weight of a Lamy AL-Star. Once I picked them up, I couldn’t stop playing with the magnetic caps which emit a satisfying SNAP when the pen is capped or posted. It’s a really cool sound, and feels a bit like the pens cap themselves. Addictive, is what it is. And so I bought the pair. Another great thing about local wares is that prices tend to be more reasonable. 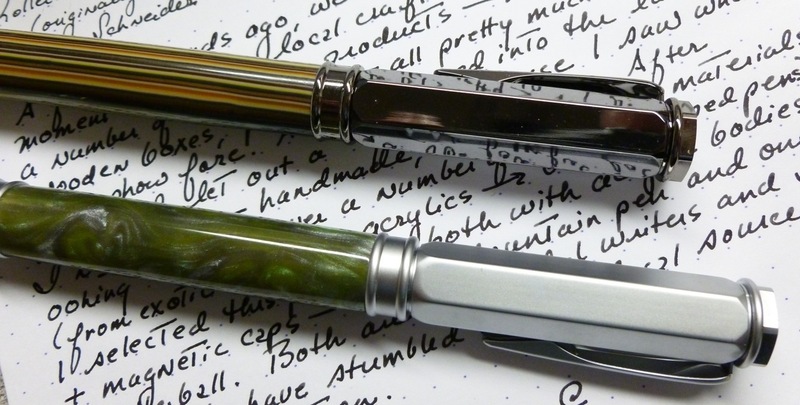 At just $27.50 for the rollerball and $31.95 for the fountain pen, it’s clear that the Lenharts are all about offering quality pens at fair prices. The rollerball came loaded with a Schneider Topball 850 0.5mm refill which is dark and smooth, but just a hair on the wet side. I’ve since swapped that refill into another pen and installed an Avant 0.5mm refill from Staples, which is a current refill favorite. Writing perfection. 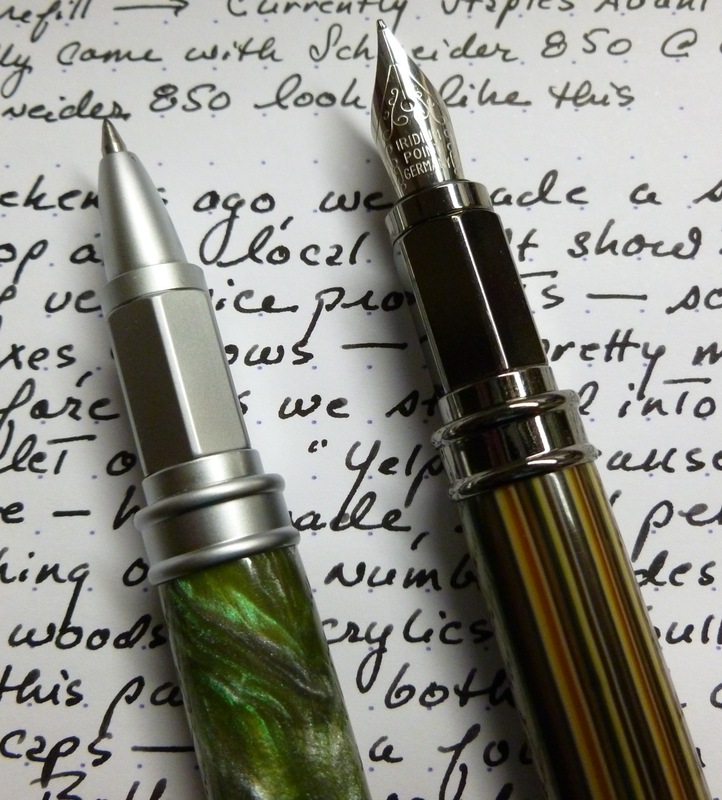 The fountain pen came with a couple of cartridges and lays down a shockingly smooth medium line. Both pens are a joy to use and travel to and from work with me every day. There’s so much talk lately about buying local, but generally that means heading to farmers’ markets for just-picked produce and right-from-the-oven baked goods, or stopping at a nearby farm for fresh brown eggs. Who would’ve thought that there would be “homegrown” pens right in my own backyard? THAT was a happy surprise.